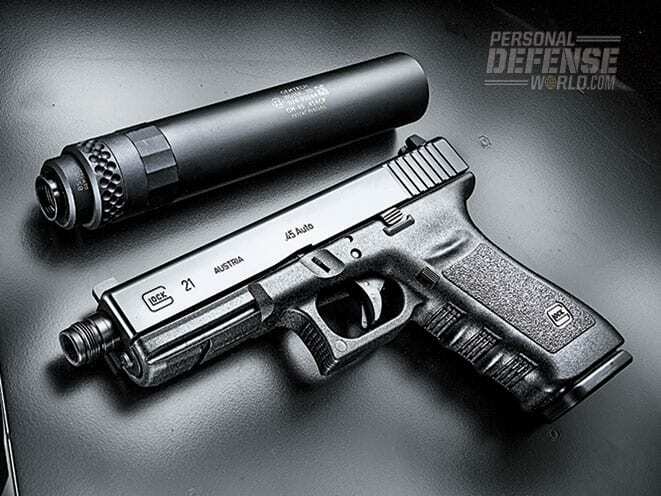 If you’re interested in using a suppressor on your Glock, you’re going to need a threaded barrel. 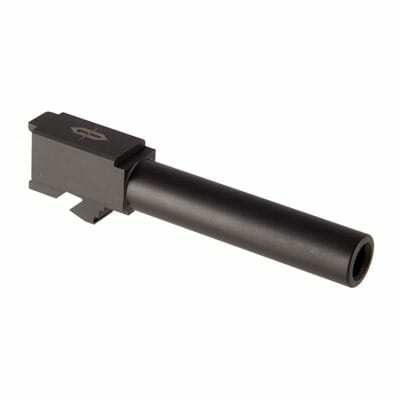 Simply put, the silencer attaches to the threaded barrel, and without one, you can’t use a suppressor. But the Glock doesn’t come with a threaded barrel, requiring an aftermarket purchase. Let’s take a look at the advantages and disadvantages of a threaded barrel, as well as the best options on the market today. Suppressor - You can’t use a suppressor without a threaded barrel. It’s really not any more complicated than that. Discretion - This is directly tied to the suppressor, of course, but with a suppressor you can minimize noise. Easy installation - Likewise, dropping a new barrel on your Glock is a cakewalk compared to other installations. Sounds good, right? We agree. But you should also be aware there are some downsides. Concealment - Having a threaded barrel and a suppressor added to your Glock is going to make it much more difficult to conceal and you’ll likely need a new holster. Weight - Adding a threaded barrel and a suppressor is going to add some heft to your Glock, which starts out pretty lightweight and manageable. If you don’t have a lot of experience with a range of handguns, this is going to take some getting used to. Additionally, there is little purpose to a threaded barrel, short of a suppressor. It wouldn’t be fair to call that a con, but just be aware that unless you’re purchasing a suppressor, you can pass on threaded barrels. Can Any Glock Barrel Fit a Glock 19? You should be careful before purchasing Glock barrels to ensure compatibility. Glock Gen 1-4 G19 barrels fit any Glock 19 up to generation 5 (so long as you are purchasing a newer factory part with Gen 5 compatibility, as they do still produce models compatible only up to Gen 4), as do other Glock barrels. We’d always recommend getting the latest generation to ensure compatibility. That said, barrels are rarely interchangeable between models. Even with the Glock 17, which is remarkably close to the Glock 19, the barrel is one of the few parts that are not interchangeable. This means that if you’re looking at creating a 'franken-Glock', you’re going to need a conversion kit. By the time you get a conversion kit, a new barrel, and a suppressor, you’re looking at quite the investment. Not only that, but it introduces a lot of unnecessary complexity and you may even need to see a gunsmith depending on what type of conversion you’re doing and how complicated it is. For simplicity’s sake, we recommend sticking with barrels that are specifically designed for your Glock 19. Ensure compatibility and ease of installation by just sticking to how the product is designed to function. Additionally, you have to pay attention to product warranties and whether they cover use on other models of handguns. For all these reasons, we’re also only going to be looking at threaded barrels designed for the Glock 19. ​What good is a crummy barrel that gives you suppression but messes up your accuracy? ​The barrel is a large component of your Glock and once you add a suppressor, you’ll have a lot of added weight. Pay attention to how much heft a barrel tacks on. ​Since you most likely want your barrel to allow you access to suppression, you don’t want to spend too much, most likely. ​Barrels can come in a variety of lengths, with larger barrels generally producing greater accuracy but more heft. We know you’re ready to get down to business with our product reviews but bear in mind the aspects to consider before you make a purchase so you get your money’s worth. All the products we’ve rounded up are excellent choices, but your unique needs will mandate which is the best for you. The partnership between Brownells and Victory First has been producing some excellent products, and these threaded barrels are no exception. Employing the expertise of Matt Jacques, a world-renowned self-defense instructor, these barrels are more than up to par. If you’re not familiar with Matt, he’s a retired law enforcement officer and proprietor of Victory First and likes to get his hands dirty with exceptional designs. Starting with a machined, high-grade 416R stainless steel that has been handcrafted to perfection, this barrel is finished with a durable and non-reflective black nitride finish. Non-reflective is a key point here, as those seeking a compressor will require stealth. Featuring a drop-in-fit with most Glock slides and a 1-10” right-hand twist, installation is a breeze and you can truly feel the quality of this barrel as it attaches smoothly. It also offers an 11” recessed crown to help protect rifling near your muzzle. Threads are 1/2" x 28 threads per inch and support either a compensator or a sound suppressor. All of Victory First’s products pass through rigorous testing to ensure the highest levels of accuracy after being handcrafted and individually inspected. It’s this commitment to quality that Victory First offers, and the commitment to value that Brownells insists upon, that truly make this partnership so excellent. This is hands-down, a great, affordable barrel that should make many who simply want a suppressor very happy. Those looking for a solid barrel that will perform to a high standard but that won’t break the bank, will appreciate the Victory First barrel produced in partnership with Brownells for Glock. Just because we love the partnership between Brownells and Victory First doesn’t mean that Brownells isn’t capable of producing excellent barrels on their own. For those who are looking for a truly budget solution, this barrel is worth more than just a look. Constructed from 416-R stainless steel bar stock and treated with a black nitride finish for corrosion resistance, this is a quality barrel at an excellent price point. It is machined with an 11-degree target crown and features a 1:10 twist rate. The 1/2x28 threads per inch are ready for a suppressor. While you don’t get the same rigorous quality inspection that you get from Victory First, this is a perfectly fine barrel that’s produced to the same specifications. It is durable, corrosion-resistant, and the black nitride finish ensures that you will remain stealthy and not prone to catching reflections on your barrel. Note that with this model you are only getting the barrel and not a thread protector. You will have to purchase that separately if you would like one. 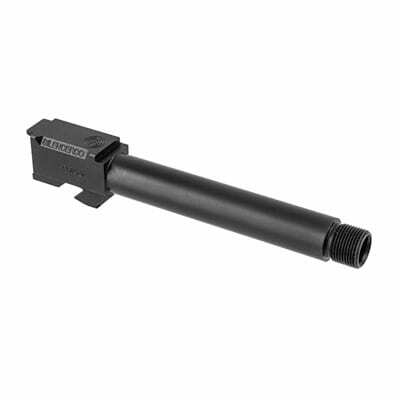 These are relatively cheap and given the low price of the Brownells Compact 9mm Barrel, adding this on will certainly not affect the value on offer here. 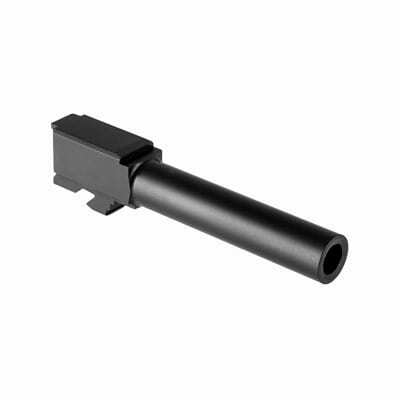 You can always count on Brownells to produce affordable parts that are still high-quality, and the Brownells Compact 9mm Barrels for Glock are a reliable gateway to a suppressor for those on a budget. You’d expect a company named Silencerco to produce a quality threaded barrel for Glock to get you on your path to a suppressor. Your expectations would be well-met. Featuring a 416-R stainless-steel construction, and available with a black nitride or a natural stainless-steel finish, these barrels are high-quality. The black nitride finish offers corrosion resistance along with an anti-reflective property for maximum stealth. Some may prefer the appearance of a natural stainless-steel finish, but we think the black nitride finish is a must-have for premium product durability and retaining stealth if you plan to use a suppressor. Featuring 1/2x28 threads per inch and compatible with Gen 3 and 4 Glocks, these should satisfy most users. Just be aware that if you have a Gen 1 or 2 Glock, this will not be compatible with your gun. However, it does include a thread protector, so you will not need to purchase this part separately. Given that it includes the thread protector, it is priced very competitively with what Brownells offers from its brand. If you prefer to purchase more popular name brands, this is an excellent value. Additionally, we find this barrel to be very easy to clean and features grouping that is a little better than a factory Glock barrel. 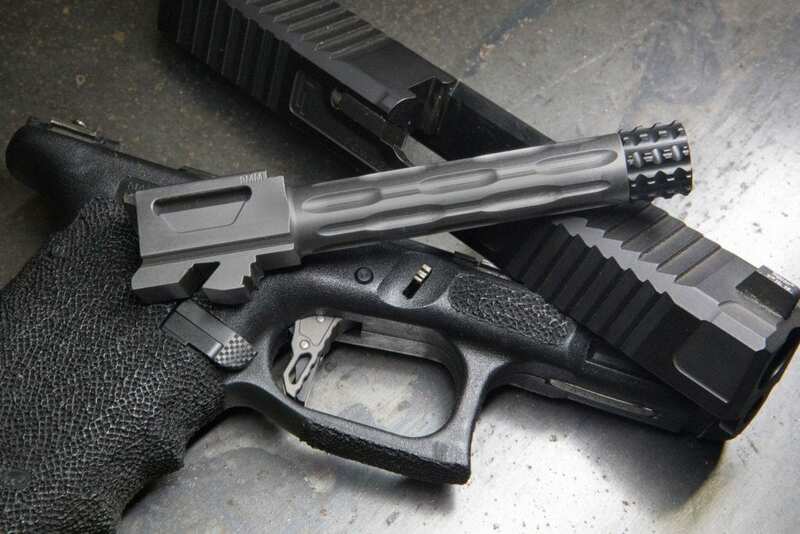 Overall, all these features make for a barrel that sits very comfortably between a budget solution and a premium barrel and should satisfy many Glock owners who want a quality, but affordable, path to a suppressor. Owners of Gen 3-4 Glocks who want to buy from a well-known brand but not spend too much money will be very happy with this well-performing barrel from Silencerco. 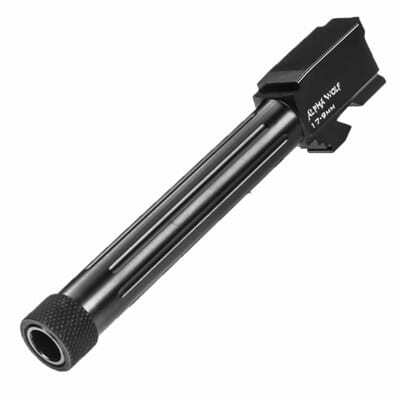 Faxon Firearms must have taken note of their competition when it came to threaded barrels for the Glock 19 because this is a barrel that should have you seriously weighing it against the others. First of all, the construction is derived from triple stress-relieved 4150 carbon steel. Not only is this an excellent choice of metal in terms of durability and on par with stainless steel, but it produces a tighter fit due to a reduction in friction. This means that the Faxon Firearms barrel offers a better lockup and your end result should be improved accuracy. Now, the results are not going to blow you away, but they are vaguely noticeable compared to other threaded barrels. Additionally, it is treated with a hard, black nitride finish to resist wear and corrosion, as well as block reflectivity, making it great for stealth. The 1/2" 28 threads per inch are suitable for either a compensator, sound suppressor, or a brake. You also get an 11” recessed target-crowned muzzle. All of this is available at an exceptional price point, making it a great value. Of course, getting quality this good at a low price probably has you wondering what the tradeoff is. Well, there are two things to be aware of. First of all, the carbon steel construction is slightly bulkier than the other barrels, although this is hardly noticeable. Moreover, it does not include a thread protector, although thread protectors are fairly cheap, so it only puts a minor dent in the value. Overall, we think this is a value that’s hard to believe, even if you have to buy your own thread protector. Especially when you consider the improved accuracy potential, this is a great purchase. Faxon Firearms has produced a fiercely competitive threaded barrel that should provide some increased accuracy potential at a solid price. Lastly, we get to Lone Wolf Dist, another incredible manufacturer, and they have also produced an excellent threaded barrel for Glock 19. As they are the highest-selling distributor for aftermarket parts for Glock, expectations for their product should be high. Crafted from 416 stainless steel, heat-treated to RC 40-42, and salt bath nitride coated, and then further fluted for heat dissipation and debris rejection, this barrel is one hardy contender. It features a button-rifled three-stage honed bore. All this attention to the build quality produces a barrel that can withstand the most powerful ammo and pump out excellent performance. You’ll enjoy high-grain rounds, up to at least 147 grain, without a stoppage in sight. It will handle rounds of this grain all the way down to +P rounds with exceptional grouping. Lastly, we want to point out what the Alphawolf line stands for, for those who are used to Lone Wolf. Lone Wolf created the Alphawolf line as part of a commitment to create a wider range of products that are manufactured in the U.S. While these cost more than the standard line of Lone Wolf products, the Alphawolf series nonetheless provides exceptional value. For those looking for a threaded barrel that can handle the most powerful rounds and still perform beautifully, Lone Wolf has produced just what you’re looking for. Threaded barrels are your ticket to using a suppressor, but you shouldn’t settle for cheap junk. Use our guide to know what to look for when making a purchase and choose from our round-up of excellent barrels that provide superior durability and performance, coupled with exceptional value. Along with a suppressor, you’ll enjoy a stealthy hunt!